Just returned from a weekend at the awesome Rockcastle Shooting Center. The Bullpup Shoot was a great success, with interesting people, gorgeous vistas and well-organized ballistic activities. Detailed report coming this week, but for now my reaction: I’ve not had this much fun in a long time. I mostly shot with my camera (almost 30GB of images) but had a chance to put a couple of mags through the MSAR and the M1A Rogue bullpups, with with very good accuracy (thank you Appleseed!) Other toys included a .308 Desert Tactical bolt action (nice trigger) and Red Jacket 10-22 conversion that is truly an inspired design. All in all, it was a great weekend, I am tired and I will post more after I get some sleep. 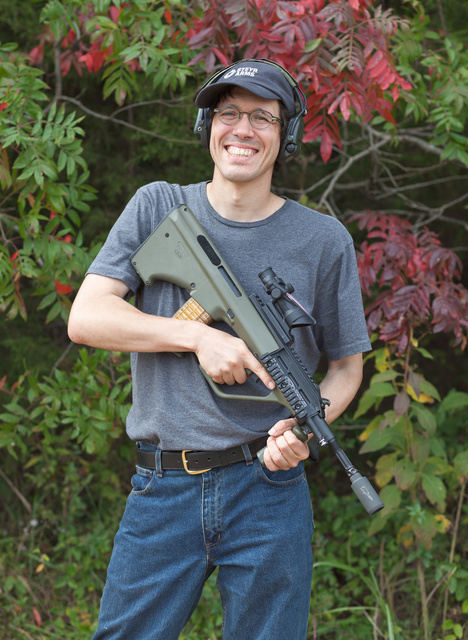 This entry was posted in author, rifle and tagged 223, bullpup, travel, Trijicon. Bookmark the permalink. Gorgeous – handsome – armed – OLEG! Олег, а имеет значение, какой стороной надевать активные наушники, микрофонами вперед или назад? You meant Rock Castle didn’t you? I’m glad you had a good time. We enjoyed having you there and taking some great pictures.